I’m a longtime supporter of the Endangered Species Act (ESA). When properly abided by, it seeks to prevent extinctions and requires humanity to seek a win-win scenario where both humans and all the other species can thrive. Unfortunately, some organizations like the Center for Biological Diversity have weaponized the ESA in order to manipulate the debate on energy policy and climate change by petitioning the courts to designate perfectly robust species as endangered or threatened from future climate change. Such abuse has understandably caused a growing backlash that ultimately threatens the ESA’s original mission. The listing of the polar bear is a case in point. Despite Center for Biological Diversity assertions that “Arctic sea ice melt is a disaster for the polar bears”, research shows polar bear populations have continued to thrive and increase. The Center for Biological Diversity also petitioned to list thriving populations of Bearded Seals as threatened or endangered by melting sea ice. In response to their petition, the National Marine Fisheries Service (NMFS) assembled a Bearded Seal Biological Review Team (BRT). The BRT’s report can be read here. Oddly, despite promoting a threatened designation, the BRT reports Bearded Seals have existed for over 1-2 million years, surviving far greater bouts of climate change as the earth bounced between several ice ages and warmer interglacials. 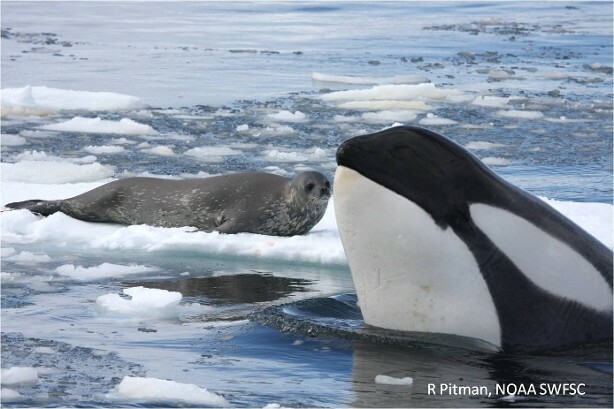 Melting ice during our recent interglacial, known as the Holocene, has been good for seals. Sea levels rose and flooded coastal areas to create what is now the seal’s prime shallow-water habitat. Our best scientific data has determined Arctic temperatures between 9,000 and 6,000 years ago were a few degrees warmer than today, eliminating remnant glaciers and minimizing Arctic sea ice. Sea levels peaked around 6000 years ago, allowing an increased flow of warm, nutrient-rich “Pacific Water” across the shallow Bering Strait into the western Arctic. Our best scientific evidence reveals periodic warm water inflows coincide with peak marine productivity. Unaffected by a slight increase in CO2 concentrations, sea levels began to fall as glaciers began to expand over the past 5000 years, the Neoglacial. Glaciers reached their greatest extent during the Little Ice Age 150 years ago. During the Neoglacial, average Pacific Water inflows subsided, average sea ice has increased, and marine productivity decreased. During this cooling trend, there were several warm spikes, usually associated with life-enhancing inflows of both warm Pacific and Atlantic water. High inflows consistently correlate with reduced sea ice and greater marine productivity. If the hypothesized warming from greenhouse gases proves to be true and if it can prevent further descent into another ice age or another little Ice Age, it is more likely than not such a warming effect would benefit the entire Arctic food web that sustains “threatened” bearded seals. The state of Alaska and the Alaskan Oil and Gas Association correctly challenged the “threatened” designation as an “arbitrary, capricious abuse of discretion, or otherwise not in accordance with law”. A district court agreed concluding that the listing indeed violated the Administrative Procedure Act. In that decision, the court reported it was troubling that the Beringia population of bearded seals was listed as threatened simply based on threats predicted by climate models that would not manifest until the end of the 21st century. However, that ruling was quickly appealed and now reversed, as the courts upheld the “threatened” designation. The judge wrote the court was required to “defer to the agency’s [NMFS] interpretation of complex scientific data so long as the agency provides a reasonable explanation for adopting its approach.” The court also ruled that the ESA requirement for proving an imminent threat in the “foreseeable future” only required a scenario that it was “more likely than not” seals could be endangered. The court ruling maintained that “as long as the agency states a rational connection between the facts found and the decision made [for listing] it must be upheld.” Unfortunately judges who decide the validity of a Center for Biological Diversity claim, rarely have any background in biology or climate science. Those judges must rely on what lawyers assert are “the best available scientific data”. But lawyers and advocacy scientists only present the “best available scientific data” that supports their arguments, and ignore equally valid scientific data that contradict their claims. Unfortunately all the known facts were not presented. So even though 2 million years of climate history illustrated bearded seals are highly resilient, the court was swayed by a limited selection of models and untestable predictions. So, as Paul Harvey would say, here’s the rest of the story. Although the Biological Review Team acknowledged “there is ample evidence that bearded seals have adapted successfully many times to both large and rapid ecological changes” they argued “history is not, on its own, an assurance that bearded seals can adapt to the changes projected for the foreseeable future.” To make the case bearded seals were threatened, the BRT argued sea ice is a critical habitat required for birthing, nursing, molting and for resting while over prime foraging habitat. Because global climate models predict critical sea ice habitat will disappear as CO2 concentrations rise, they argue the seals are ultimately endangered. However ample evidence suggests sea ice is not a survival requirement. When Bearded Seals do haul out onto sea ice, they prefer tiny floes of thin first-year ice. Climate change, whether natural or anthropogenic, will not eliminate that first-year ice. As the BRT reported, “sea ice will always persist from late fall through mid-summer due to cold and dark winter conditions.” Much of the Bearded Seal’s habitat encompasses seasonal ice zones where first-year sea ice is renewed every winter but melts completely every summer. The Bering Sea, Barents Sea, Baffin Bay, the Sea of Okhotsk, and Hudson Bay are all seasonal ice zones. Renewed winter ice reaches its maximum in late March about the time of the solar equinox. Simultaneously whelping (giving birth) begins in March and peaks in April followed by 2 to 3 weeks of nursing, a time with plenty of ice. The loss of thick multi-year ice over the deep Arctic basin in September has no effect on bearded seals survival. Heavy sea ice is a bigger threat to bearded seals, so they avoid regions where sea ice cover is more than 90%. Heavy sea ice acts as a barrier that prevents access to their feeding grounds. Each winter bearded seals in the Pacific sector migrate southward as winter ice prevents access to their favored feeding grounds. As sea ice recedes with increasing spring and summer insolation, feeding grounds once again become available. Bearded seals are in competition with other benthic (sea floor) feeders, walrus and gray whales, who likewise migrate into the Arctic as the ice melts. Due to the advantage of accessing the sea floor as soon as dwindling sea ice permits, bearded seals are frequently associated with 70 to 90% sea ice concentrations. Although resting on floating ice above their feeding grounds imparts a small energetic benefit, it is not a life-saving requirement. For example, although the sample size has been very small, studies of radio-collared seals in the Bering and Chukchi Seas observed those seals rarely hauled out at all, on land or sea ice, even when occupying ice covered areas. The BRT concluded that “at least in the Bering and Chukchi Seas, bearded seals may not require the presence sea ice for a significant part of the year”. But breeding seals’ ice association is not a matter of preference or a requirement! To maximize the time spent over accessible foraging grounds, pups are born in the spring when winter sea ice begins its retreat. As the BRT reported, bearded seals prefer foraging in open ice cover where the sea floor is less tan 100 meters deep. Thus, to whelp in April and still remain for over shallow feeding grounds, seals are coincidentally surrounded by extensive winter sea ice. Figure 1 below illustrates the Pacific sector’s potential foraging grounds. White regions mark shallow areas, typically 50 to 100 meters depth. Because bearded seals cannot forage in deep waters (illustrated by the dark blue color), they cannot breed in ice free waters located south of the shallow Bering Sea. The illustration’s colored lines represent the “ice front” position each month. In March, sea ice concentrations less than 15% are found to the south of the light green line. By peak whelping time in April, heavy sea ice concentrations (turquoise line) largely remain as in March. Thus, during the optimal season for whelping, 99% of their foraging habitat is covered by ice concentrations greater than 15% and as high as 100%. Seals do not prefer to breed in this heavy ice! They are forced to if they want access to required shallow feeding grounds. 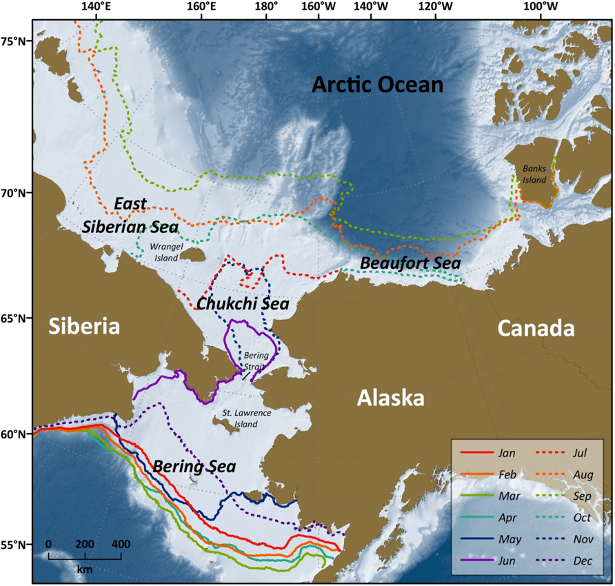 Consistent with this analysis, the BRT reports during the spring in the eastern and northern Bering Sea, the Chukchi Sea, and the Laptev Sea, where much of the first-year sea ice is heavily compacted, breeding bearded seals are not found in any significant numbers. On the other hand, bearded seals are definitely adapted to survive in ice free waters. Mating always happens in the water. Native Arctic hunters observe seals giving birth in the water. Furthermore, bearded seal pups are well adapted to enter the water immediately after birth. Harp Seals for example require weeks of development on the ice. To thermo-regulate harp seal pups are born with a white fur called the lanugo. The lanugo provides excellent protection from cold air, which is why baby Harp seals were heavily hunted for the fur trade. But the lanugo provides little insulation when wet. So after a few weeks, Harp seals molt their lanugo and gain a protective layer of fat so they can enter the sea. In contrast, most Bearded Seal pups amazingly molt their lanugo within the uterus. They are also born with a thicker layer of blubber and begin foraging in the sea right after birth. So, birthing on an ice floe is more likely a convenience, but not a requirement. Although it has not yet been reported, newborn pups are probably capable of nursing underwater as well. Based on the amount of time spent in the water right after birth this seems likely. Marine mammals such as whales and manatees must nurse underwater. And although California Sea lion pups primarily nurse on land, they too have been observed nursing underwater. In habitat where sea ice either melts completely or recedes beyond the limits of shallow-water feeding grounds, bearded seals simply come ashore. Observations of seals on dry land have been documented for the White and Laptev Seas, the Bering, Chukchi and Beaufort Seas, for Svalbard, the Hudson Bay and the Okhotsk Sea. The Okhotsk and Kamchatka populations thrive in the most southerly part of the seal’s range where ice melts completely each summer. There, bearded seals form numerous shore rookeries comprised of tens to hundreds of individuals, during a time that overlaps with molting. Finally, their preferred small ice floes do not offer protection from the seals’ 2 major predators. Polar bears are well adapted for surreptitiously swimming up to floating ice and snatching an unwary seal. Killer Whales readily grab a seal from floating ice or tip that ice over, dumping the seal into the water where it is no match for the Orca. Thus, many lines of evidence suggest it is “more likely than not” that observations of bearded seals resting on sea ice platforms is only evidence of a convenience, not a survival requirement. The Biological Review Team included one climate scientist, James Overland and he predicts the Arctic will be ice free within the next decade or two. (By “ice free” he means September ice will be reduced to about 1 million square kilometers.). Although there is a general consensus among models that rising CO2 will drive warming and continued ice melt into the future, IPCC models failed to predict the current level of rapid sea ice reduction. Because IPCC models projected currently observed sea-ice reduction would not occur until 2070, Overland believes IPCC models were simply too conservative. However other evidence suggests the models are flawed because they did not accurately incorporate natural variability. Nonetheless, Overland used a select group of 6 IPCC models to convince the courts rising CO2 concentrations threatened to destroy and modify the seals’ sea ice habitat. For the BRT analysis, Overland culled the most flawed IPCC models. His chosen models had to simulate the seasonal changes in ice cover to demonstrate an accurate sensitivity to changes in solar insolation. In addition, chosen models had to simulate (hindcast), within 20% accuracy, September sea ice extent observed from 1980 to 1999. The number of IPCC models fitting this selection criteria was reduced to six. However, the time span to accurately test the models’ reliability was far too short. IPCC models attempting to replicate 20th century Arctic air temperatures have failed to reproduce the rapid warming from 1920 to 1940. Furthermore, those 6 models failed to accurately simulate observed sea ice extent for individual Arctic basins. As seen in the graph above from Gillett 2008, IPCC model simulations based solely on known natural factors (the blue line labeled NAT), erroneously reported no change in 20th century Arctic temperatures. Observations revealed (the black line labeled OBS) temperatures had naturally oscillated. Actual temperatures compared to model results were as much as 0.6 C degrees higher in the 1930s and 40s but then lower after the 1960s. 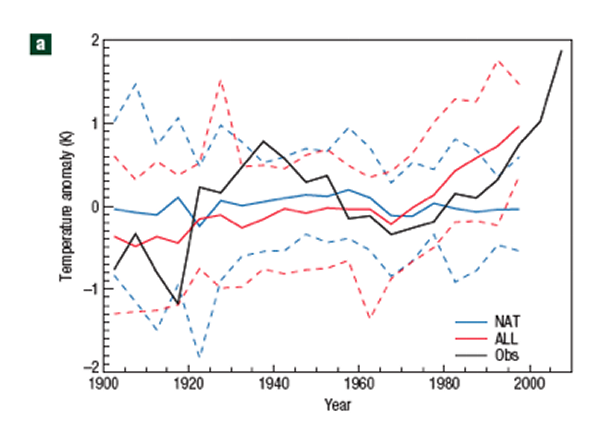 More disconcerting, when models added the effects of CO2 and aerosols to natural factors (the red line labeled ALL), discrepancies between models and 1940s observations worsened. A modeling study by Johannessen 2004 failed similarly. In contrast to flawed CO2-driven models, it is well-documented that warming from 1920-1940 as well as the current sea ice loss is more parsimoniously attributed to changes in atmospheric and ocean circulations that pump warm southerly air and water into the Arctic. Although judges believed they were presented with the “best scientific models”, those best scientific predictions had failed to simulate past natural climate change. The BRT did not inform the courts of research that shows a small Arctic cooling trend for the period 1901 to 1997, a trend contrary to the CO2 global warming hypothesis. A similar cooling trend was reported in the 1993 paper, “Absence of Evidence for Greenhouse Warming over the Arctic Ocean in the Past 40 years”. Nor did the BRT discuss research detailing how the loss of sea ice in the 1990s was not caused by warmer air, but by a shift in the Arctic Oscillation resulting in below-freezing winds that pushed thick insulating ice out into the Atlantic. Furthermore, it’s not obvious that the BRT advised the judges that our best scientific data has observed that past and recent reductions of sea ice have coincided with intrusions of relatively warm Atlantic and Pacific waters. Fishery data shows warming in the 1930s coincided with the arrival of fish normally found further south. Recent analyses show similar northward fish migrations are associated with intruding warm Atlantic waters, driven by natural shifts in the North Atlantic Oscillations and Atlantic Multidecadal Oscillation. In the Atlantic sector, the greatest loss of Arctic ice occurs in the Barents Sea and associated with the pathways of intruding warm water. Intruding dense salty warm water also generates a reservoir of Arctic heat stored between 100 and 900 meters depth. That heat reservoir can melt all Arctic sea ice several times over. Indeed, the most recent scientific research reveals that warm reservoir has been rising closer to the surface and thinning sea ice. Researchers called this dynamic the atlantification of the Arctic Ocean. In 2007, the greatest reduction of sea ice happened in the Chukchi Sea. Research by Rebecca Woodgate using mooring and satellite data, documented the volume and heat content of intruding warm water. She reported Pacific water passing through the Bering Strait into the Chukchi had doubled since 2001. The inflowing Pacific Waters spread across half the Arctic Ocean with a heat equivalent equal to, and up to twice as great, as possible heat estimated from CO2 back-radiation. The amount of heat carried by those intruding waters was comparable to the solar heating of the entre Chukchi Sea. The resulting enhanced loss of summer and winter sea ice resulted in feedbacks, associated with Arctic Amplification, which has raised Arctic air temperatures at a rate twice the global average. Less insulating ice allows the heat reservoir to more easily ventilate, cooling the ocean but warming the air. Furthermore, researchers show the loss of sea ice reconnects the oceans with the winds causing a stirring effect that brings warmer water to the surface. Less ice lowers the ocean’s albedo allowing more solar heat to be absorbed. Finally, the re-formation of lost ice, releases more latent heat. All those warming effects caused by increased inflows, have been myopically attributed to rising CO2. Less ice benefits the food web. As outlined by Grebmeir 2015, the productivity in the Chukchi Sea (and likely the entire Arctic ocean) depends on the inflows of nutrient rich waters. The same intrusions of warm water through the Bering Strait that reduces sea ice, also bring vital nutrients that increases productivity, as well as bringing warmth that enhances faster growth. Our best scientific evidence suggests that if the Arctic becomes ice free by mid-21st century, more open water will enhance photosynthesis so that marine productivity will increase by 67%. Thus, it is “more likely than not” that the dynamics that are now reducing Arctic sea ice are also increasing the food supply, not just for bearded seals but for the whole food web. Because bearded seals currently consume a huge variety of fish and invertebrates, it is highly likely bearded seals will easily adapt to any foreseeable changes in the food web. When the “rest of the story” is told, it seems highly unlikely bearded seals will be endangered by reduced sea ice or warming temperatures. It is the Endangered Species Act itself that is endangered because the Center for Biological Diversity and their ilk abuse the ESA to promote climate fear. Instead what should rightfully evoke our greatest concern is how climate change alarmism is eroding objective science, allowing untestable hypotheses and flawed models to become codified in our legal system.